Convenient Velcro side entry pocket for crampons, water, camera, jacket, etc. that can be zipped open to extend the main compartment. 2 ski carry options for different race formats: Tubular Rewind for typical rando races and a Hook Rewind (+3g) for sprints and relays. Removable Truck Bull tethering system (+21g) can be used to tow a slower partner during team races. Ventilated shoulder straps have pockets that fit energy gels or bottles. Loop and cord ice axe carrier fits any size axe so you're ready for technical races or touring. Improved EZ OP buckles with special pull tabs for fast and easy one-handed operation. Multiple storage options as the upper compartment can combine with the lower side access pocket. Shovel blade fits neatly in the upper section while handle and probe slide behind into the hydration sleeve area. Internal security pocket for small items like a cell phone, map, emergency blanket, etc. Ski carry fits tails up to about 135mm in width (can be retied smaller) and comes with a sheathing to keep the loop open wide. Pack is hydration sleeve compatible and even comes with a built-in whistle. Update for 2017/18: CAMP changed the colors to Orange, Black, and White. They also repositioned the main ski carry loop for better ergonomics, quicker transitions, and more secure carrying. The backpanel was reinforced where the bindings contact the pack in carry mode. In additional the Velcro crampon doors was reinforced for extra durability and the chest strap now has a height-adjustment. Notes CAMP seems to have thought of everything. Bottom Line Lightest pack with all the race features. So far, so good as far as a race pack. I like the new wire strap for race and lighter skis. Just large enough for puffy, spare skins, pons, shovel, probe, flask and emergency bivy. So far the fabric has held up fine, but be careful with it. I wish the internal divider went forward so the shovel/ probe could go full length without having to have the divider open, but just requires a little more caution when opening the bottom. Nice to have velcro on bottom compared to the zippers on the skin pack. I purchased the CAMP Rapid Racing Pack for resort training, racing, and for spring touring in the North East. I used it for a number of days of both inbounds skinning and in the backcountry over the past season. As advertised, this is a lightweight pack, and has a number of useful features for fast tours. The side access crampon pouch is easily accessible, allowing storage of frequently needed items without having to dig through the pack. When not needed, the separator can be unzippered to allow for more room in the main compartment. The pack also comes with two ski carry options: the metal hook or the wrap around strap, either of which work well to stow skis securely without removing the pack. As others have mentioned, the clip for the wrap around strap is difficult to stow, and frequently comes undone from it's clip when not carrying skis, which is a minor nuisance. CAMP's buckles work well with gloved hands, and though their percieved durability is not confidence inspiring, I had no issues during use. Durability of the pack, however, presented an issue. While one must expect a trade-off in durability in any lightweight product, I was surprised to have a major issue during standard use. While hiking an approach on a spring tour using the ski carry, the lower seam on the ski carry side separated from the remainder of the pack. Fortunately, it did not cause the contents to release, and I was able to mend it with some tape for the remainder of the tour. I was able to return the pack on warranty, but feel this warrants a slightly lower rating, since it appears others have had similar issue. The CAMP Rapid Race Pack is an extremely lightweight and functional pack. When used in it's intended environment, i.e. racing and training, it will no doubt serve well. If you're looking for a pack to use for daily touring or spring mountaineering, however, it's probably best to look to a slightly heavier, more durable pack. Hi Tom, indeed, CAMP has a more durable version of this pack called the Rapid (not Rapid Racing). What is the difference between the one from last year and the one form this year? Hi Arnaud, CAMP updated the colors to white/red and beefed up the sprint hook a little. Skied with this pack yesterday. Loving it! Super light ad functional. I do have one question - when you're not using the ski attachment hook and secure straps where are they supposed to live without flapping around? I stuffed them up into the shoulder strap thing opposite where the drink tube goes. This seems like it would be timeconsuming though before or after a boot pack transition. So what's the fastest stow away for these straps coming out of a boot pack to skin transition? Hi Spindogg, in theory those can stow on the shoulder clip that secures the strap when carrying skis. In practice it's not the most reliable retainer so you can just tuck it wherever. Would a BCA B1 shovel and the standard Arva (not compact) probe fit in this pack? Hi Rom, you can fit those in the pack. It's only 20 liters so there isn't a ton of room, but it will hold the essentials including shovels with reasonably sizes blades and collapsible handles like the B1. Overall: Five Stars for a skimo race pack that is perfect for skimo racing with only a negligible amount of extra weight for enhanced utility for “real” ski mountaineering. Background on product familiarity: I used my Rapid Racing pack during the 2014-15 season on many ski mountaineering tours (both winter and spring) even loaded up with sharps (ice axe, boot crampons, ski crampons) and avy rescue gear. 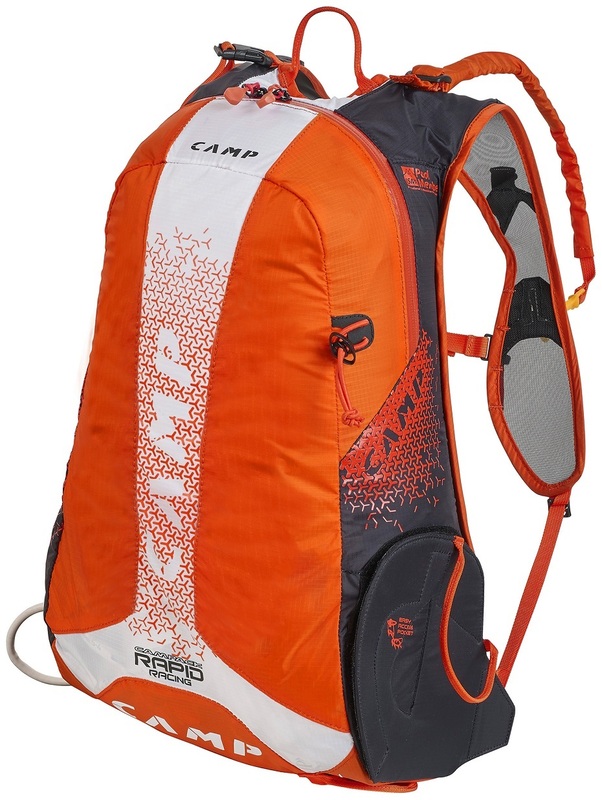 I’ve also used CAMP’s very similar Rapid 260 pack for four years of racing and training, plus some touring. Competitor packs I’ve used include the Trab World Cup Aero, Dynafit RC 20, and Dynafit Broad Peak 28. First, the first impressions out of the box: Despite the minimal weight, the fabric feels substantial, and the feature set is anything but minimal. 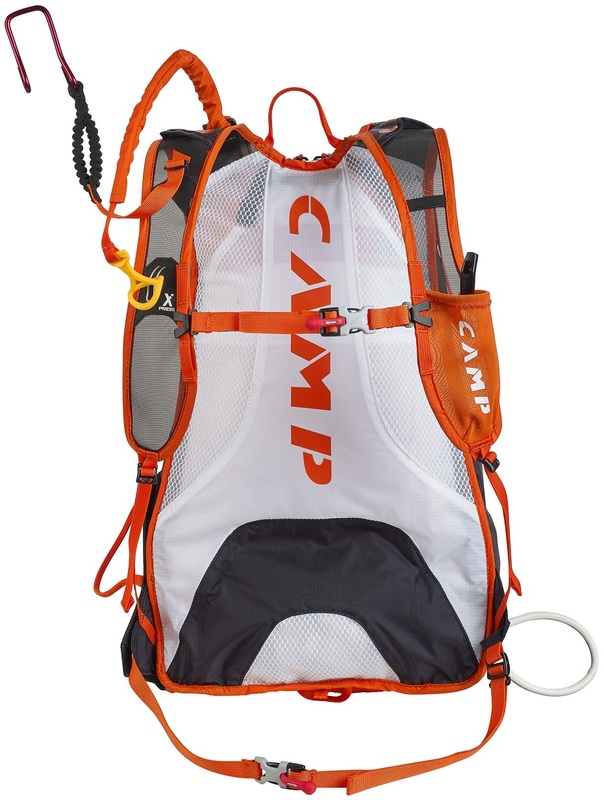 By carrying water on the outside with CAMP’s own Action Bottle and Holder, the 20-liter capacity is true enough to carry a full load, although all my gear was very compact (e.g., CAMP Race 290 crampons, ARVA Ultra shovel, ARVA Carbon 240 Compact probe). Third impressions, for long-term durability: … the sewing on the waist belt attachment to the center buckle came entirely undone, but this was easily replaced with a nearly weightless “single bar slide” that now both secures the strap to the buckle and substitutes its adjustability for the popping-prone original clip (which I now have set up to let out as much strap as possible, so its open versus closed position is moot). The sewing also started coming undone at the shoulder strap’s attachment to the safety box, but it’s stayed fine after a few stitches with a Speedy Stitcher Sewing Awl. The interior of the side-access bottom compartment might be suspect with boot crampons and ski crampons, but I protected it with a nearly weightless cut-up blue foam pad (secured in placed with sticky velcro) so as to also provide an emergency insulated pad. 1- Would 2 ice axes (Petzl Quark) + skis fit on it? If so, would the ice axes move around? I intend to mix run, skin an Ice climbing (waterfall) up and then skiing down. 2- I'm new to skimo and will do my first races this winter, do you recommend adding the camp bottle cage to the bag? Does it fit well on it? I guess it would sacrifice a pocket but I need water close to me. 3- I have Nanga Parbat skis with Plum race 135 bindings, can you confirm that they would fit well on the pack?  Hi Richard, thanks for the feedback! 1- You can get two axes in the loops in a reasonably secure fashion, although I haven't tried with the big handles on the Quarks. Note this is an ultralight race pack designed for one ax so it may not last you decades in this configuration. 2- The bottle holder Velcros around the little horizontal band on the wearer's left strap, and can be secured at the bottom by tying in some of the excess strap webbing. Depending on the race and temperature, it's a reasonable option. 3- Yes the Nangas fit in the ski carry system. The 2013-2014 Rapid is definitely a step up from the previous version despite a very close resemblance. The lower elastic ski carry loop that was fraying badly on my old pack is reinforced with a new plastic tube coating. 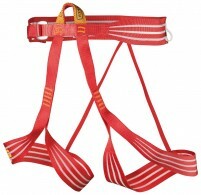 The upper strap now has two options, the traditional and more secure loop that clips back on to the shoulder strap or the quicker hook that hooks directly to the skis (shown in the pic above). I pulled off the traditional loop and used the hook. The strap is not elastic like dynafit versions but the slack in the bag makes up for it. My only complaint is the hook dangles when not in use. The waist and sternum buckles have been upgraded to slightly larger and more manipulable size. An ice axe loop has been added.